Daleville and its jurisdiction is served by a volunteer fire department staffed by Daleville Department of Public Safety (DPS) employees , city employees and volunteers from the community. It is the mission of the Daleville Department of Public Safety's Fire Department to preserve life and property. We strive to provide the highest quality of service possible, characterized by responsiveness, and professionalism. We will continually strive for quality improvement. 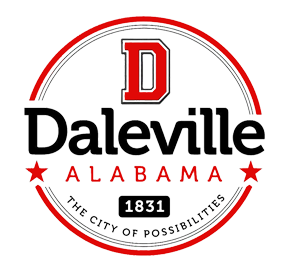 We owe to the citizens of Daleville and the residents of our fire jurisdiction our full commitment and dedication to being there when you need us. For administrative matters contact the fire department at 334-598-4442 or in an emergency dial 911 for the Daleville / Clayhatchee 911 center. Interested in Joining our Team and Becoming a Volunteer Firefighter? Volunteer firefighting is a very rewarding and valuable way to serve our community. It takes dedication and hours of training to become a volunteer firefighter. If you are willing to put in the time and effort, the Daleville Department of Public Safety is ready for you to serve.